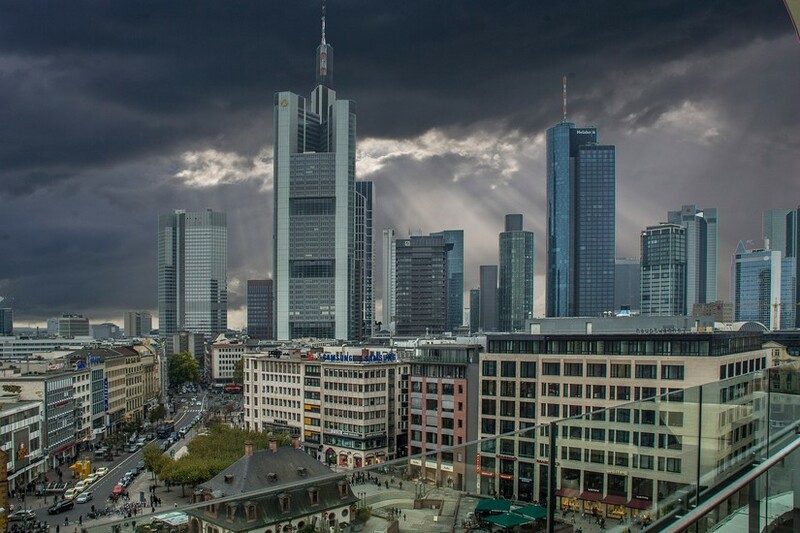 With ten buildings over 150m high in the city centre, Frankfurt (jokingly nicknamed Mainhattan, after the Main river) has a unique skyline for European terms. Wartime destruction and the need for office space during Germany’s economic boom in the 1960s and 70s led the Frankfurters to look up for space solutions. Indeed, judging by the uninspired architecture (to say the least), the motto of those decades seemed to be stick your banks in the air like you just don’t care. Although Frankfurt is mostly known for the skyscrapers that were built in recent decades, the tradition of high buildings in Frankfurt dates back to the 1920s. Apart from some highrises that have top-floor restaurants, only the Main Tower is currently open for the public. 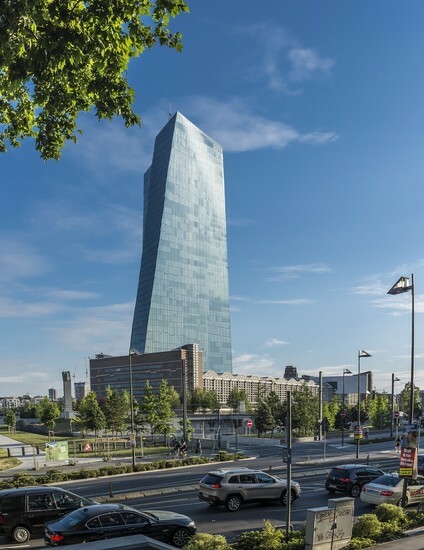 Although the highest structure in town is the 331m Europaturm television tower in the northern outskirts, the highest skyscraper is the triangular Commerzbank Zentrale at 259m (300.10m if you count the mast and the little blinking light at the top). It’s also the highest in Europe, though a planned building in London is set to beat it soon. 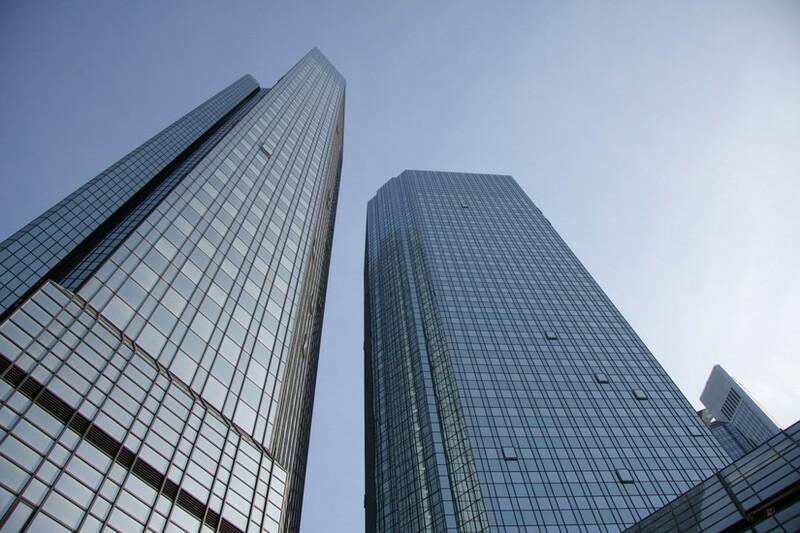 Size does matter when boys play with building blocks – the Commerzbank is a full two metres higher than the previous highest building in Frankfurt and Europe, the MesseTurm (Trade Fair tower, 257m). Third in line is the Westend Straße tower near the station (208m). The crown at the top of the building needs heating in winter to prevent icicles from forming. The 200m Main Tower with its viewing platform is next, followed by the 186m Trianon building, which has an upside-down triangular mirror on the roof. 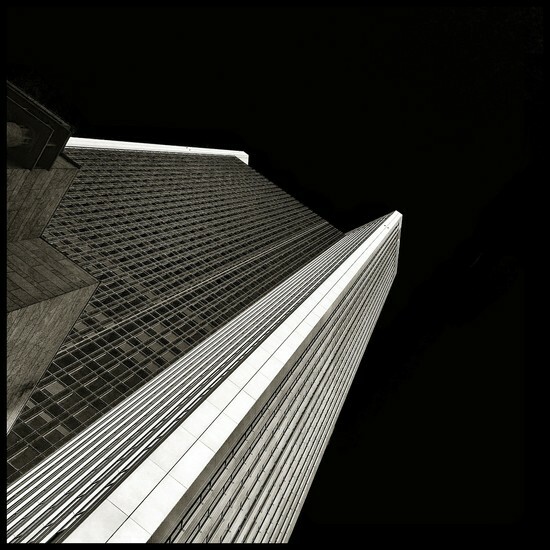 Holding the record for 15 years from 1978, the Silver Tower houses the Dresdner bank, and used to have a top-floor swimming pool which the bankers later replaced by a conference room. 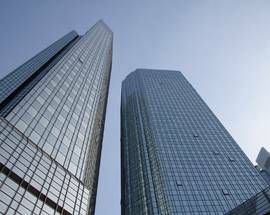 The Marriott hotel has checked into the 159m Plaza Büro Center, and next up are the 155m twin towers of the Deutsche Bank, also nicknamed Credit and Debit. 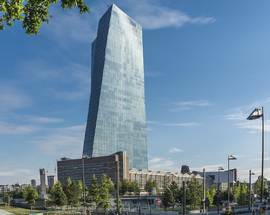 European Bank president Jean-Claude Trichet rules over Euroland from the 148m Eurotower, though his little enterprise is scheduled to move to a new 160m-high tower across the river in Sachsenhausen in 2007. Another remarkable highrise is the 120m Henninger Turm, which is basically a rotating restaurant that was stuck on top of the Henninger brewery silo in 1961. The brewery is bankrupt, the terrain sold, and the tower is slated for demolition, though this has led to an outburst from Frankfurters who have happy childhood memories of the rotating floor and the views. Architecturally, the Japan Center (115m) may be the most interesting skyscraper in the banking district, with its characteristic Japanese design and overhanging roof. The most beautiful one however must be the Main Plaza. This hotel may be a mere 88m high, but it’s made with bricks and is inspired by the 1920s American Radiator Building in midtown New York. Fans of 1970s architecture should head out to the Niederrad office area to view the remarkable 57m-high, boxy Olivetti Turm. Finally, the pretty brick Mousonturm deserves a mention, even though at 33m it doesn’t even reach to the knees of its big brothers. Once a soap factory, it now houses a theatre and a (ground floor) restaurant. 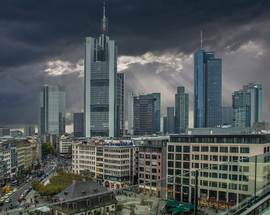 Frankfurt’s skyscraper building boom has ground to a halt recently due to the stagnating economy. The curiously named Skyper (we’d perhaps suggest a more feminine name like Skyliner©) is the only skyscraper that is currently under construction; it will reach 154m when finished. 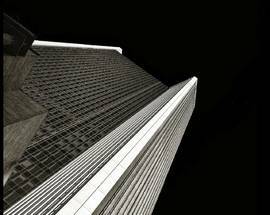 Dozens of ambitious projects for bigger and better skyscrapers have been shelved. The gaping hole west of the Alte Oper (where one of Frankfurts older highrises stood) and the desolate wasteland south of the Messe are waiting for better times. A great (and free) view of the skyline can be had from the top floor of the Zeilgalerie mall, which is connected to the rooftop terrace of the Galeria Kaufhof department store (see Shopping). The only skyscraper that allows the public in is the Main Tower; click here for more information. For more information on skyscrapers in Frankfurt and elsewhere, see www.emporis.com.